As early as 1849, small pioneer cemeteries could be found scattered throughout the area that is now Duluth. By 1870, the year Duluth first became a city, demand surfaced for a truly large cemetery within city limits. 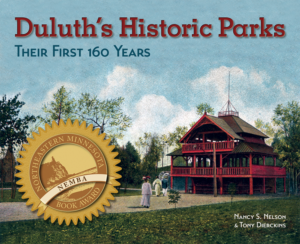 In October 1872 the Duluth Cemetery Association organized to find an appropriate site, electing James D. Ray as its president. Ray first came to Duluth from Ashtabula, Ohio, in 1855, but left after the Panic of 1857. He returned to Duluth just before the end of the Civil War and began buying up property, much of it abandoned by his fellow 1850s pioneers. He subsequently made a fortune in real estate, accumulating extensive property in Duluth and the Mesabi Iron Range area. The tract is a beautifully located one, lying on a gentle rise; covered principally with maple trees; and the small stream which passes Decker’s brewery runs though its entire breadth. It is approached by Piedmont Avenue [today’s Mesaba Avenue], which intersects the Rice Lake Road. Essentially, today the site would be centered at about the top of Thirteenth Street where Mesaba Avenue becomes Rice Lake Road. Most of the stream—Brewery Creek—has long since been forced underground. Apparently, the Panic of 1873 put a halt to cemetery development, as there are no records of anyone buried in this location. When Forest Hill Cemetery did open—in October 1879—the property was described as running from East Fourth Street up to East Seventh Street between Twelfth and Fourteenth Avenues East. Chester Creek, not Brewery Creek, meandered through the property. This site also contained part of the claim of Chester Creek’s namesake, Charles Chester, who like Ray left Duluth before 1860. But Chester never returned, and Ray purchased his property. 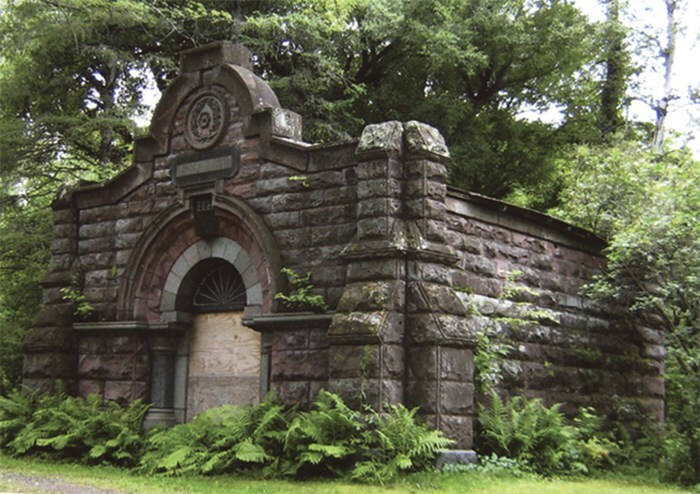 The vault will have a frontage of twenty-five feet and a depth of about thirty… The material used in its construction will be heavy blocks of Fond du Lac brownstone and Duluth granite… The entrance will be flanked on each side by pillars of polished granite and surmounted by a stone arch. The doors will be of polished granite, enormously heavy, and an effectual bar to all intrusion. Over the entrance, carved in the stones of the arch, will be the date, 1885, and the words ‘Forest Hill Cemetery.’ The roof will be of arched brickwork and covered with iron. The Duluth Weekly Tribune predicted the vault could hold sixty caskets waiting for burial. In June 1888 the Forest Hill Cemetery Association—which replaced the original cemetery organization—announced it had chosen a new cemetery site along Woodland Avenue that was then far away from Duluth’s residential neighborhoods. By May 1890 the new Forest Hill Cemetery was accepting transfers from its original location. Ray remained heavily involved. During May and June 1890, Duluth newspapers carried daily announcements from Ray stating he would meet with relatives or friends of those buried in the old cemetery to make arrangements to move bodies to other cemeteries, usually the new Forest Hill. In October 1890 a judicial order vacated the old Forest Hill Cemetery “preparatory to platting.” The first house built in the old cemetery may have been constructed as early as 1891, before the grounds were completely vacated. The 1885 vault was used during the relocation process. In August 1892 the vault was described by the News Tribune as being in “rather bad shape.” All caskets were reported moved by the end of 1892—but some were missed. In 1912 while excavating for a basement at Thirteenth Avenue East and Fifth Street, workers unearthed three bodies. They were reburied in the new Forest Hill Cemetery. Apparently, the old vault was moved to Forest Hill about this time—at least temporarily. In 1907 the Duluth News Tribune announced that ground had been broken in Forest Hill for a new vault and chapel. Eight years earlier the News Tribune had reported that the Woodland Cemetery Association was planning extensive improvements to its site on Woodland Avenue north of Calvary Road. The facility was established in 1895 by Temple Emanuel as a Jewish cemetery. By 1910, the 1885 Forest Hill vault had been relocated to the Temple Emanuel cemetery. It remains there today, although in disrepair. The words “Forest Hill” have also been removed. Today the site of the original Forest Hill Cemetery contains both a residential neighborhood and the southernmost portion of Chester Park; there is no indication it was once a cemetery.